What a year for mortgage rates. So far in 2017, rates have gone as high as 4.30% in March, only to hit a low of 3.86% in August, according to mortgage agency Freddie Mac. That’s a 44-basis-point reduction in five months, shaving $60 per month off a $250,000 mortgage. The only thing is, mortgage consumers haven’t noticed. Everyone heard about the epic increase after the 2016 election. Rightly so. Rates jumped 85 basis points in ten weeks. But media outlets aren’t as excited to report on the steady downward drift mortgage rates have experienced this year. No matter. The word is getting out: Rates are falling back toward late-2016 levels. This is the second chance home buyers and refinancing homeowners have been waiting for. The average conventional 30-year fixed rate mortgage is now solidly in the 3s. Freddie Mac’s Primary Mortgage Market Survey (PMMS) revealed that rates averaged just 3.86% as August came to a close. These are the best rates since the second week of November 2016, and the best rates of this year by a decent margin. 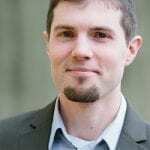 Why are rates so good? There are a number of factors working together to keep rates low, including an administration still unable to bring an economic boost, low oil prices, geopolitical stress, and ultra-low inflation. And, though Freddie Mac reports only on conventional mortgage rates, all types of mortgages are experiencing similar improvements. Mortgage software giant Ellie Mae tracks not only conventional rates, but other types, too. Following are mortgage rate reductions since April. USDA loan rates are similar to VA ones, and have dropped significantly this year as well. What type of loan and rate should you get? It depends. Home buyers with high credit and at least 3% down might choose a conventional loan. The Conventional 97 and HomeReady loan are built for newer buyers who don’t have the big down payment most people assume is required for conventional. For homeowners looking to refinance, conventional loans are best for those with at least 20% equity. And more homeowners are using this loan to cancel FHA mortgage insurance. Home values are rising, and FHA loan holders should consider getting rid of an expense that often amounts to hundreds of dollars per month. FHA loans are ideal for those without a perfect credit score. But high-credit home buyers are using them, too. This type of financing requires 3.5% down, or around $7,000 on a $200,000 home purchase. That down payment level is within the realm of reason even for low-income home buyers. Income requirements are more flexible than for conventional loans, so many new grads just starting out in their careers can benefit. But FHA is not just for home buyers. The FHA streamline refinance is a powerful tool for homeowners with an FHA loan currently. No income documentation is required. That means you can still qualify even if you’ve experienced a reduction in family income, but still need to lower your home payment. A traditional refinance requires pay stubs, W2s, and sometimes tax returns. Many homeowners wouldn’t qualify for the even though it puts them in a better position. The loan doesn’t even require an appraisal, and the current value of your home absolutely does not matter. You still need to come up with closing costs, and most lenders require a minimum credit score. But this loan product removes most of the traditional barriers to refinancing. Though it sounds too good to be true, the VA streamline refinance is even more flexible than an FHA streamline. It requires no income documentation and no proof of savings or money in the bank. VA loan rates are some of the lowest on the market. In fact, Ellie Mae says VA rates are more than a quarter point below conventional ones. You must currently have a VA loan, but you don’t have to prove your eligibility again when getting a VA streamline loan. Current and former U.S. military service members should verify whether they have a VA loan. If they do, they should check today’s rates. Hundreds per month in savings could be at stake. Home buyers with military service have access to one of the greatest mortgage types of all. The VA home purchase loan is a 100% financing home loan that does not require good credit. VA loan home buyers routinely save hundreds per month over FHA and conventional buyers. On top of the other benefits, this loan requires no monthly mortgage insurance. There’s simply no better loan on the market for home buyers who have a military background. The United States Department of Agriculture promotes homeownership in less populated areas with its USDA loan. It’s a zero-down mortgage with which home buyers can purchase regular homes. It’s not for farms, in fact, and income-producing agricultural properties are not eligible. Rather, the loan allows families to purchase homes in rural and suburban neighborhoods across the country. About 97% of U.S. land mass is eligible for a USDA loan, much of it just outside major metro areas. Mortgage rates for these loans are low, and often parallel ultra-low VA loan rates. They come with monthly mortgage insurance that is less expensive than for FHA loans. On a $200,000 home purchase, mortgage insurance is as follows. Remember that USDA requires nothing down, and FHA’s minimum is 3.5%. So you could end up with a lower payment while hanging onto precious cash when choosing USDA over FHA. USDA also offers a streamline refinance. You don’t need to verify your income, and the lender waives an appraisal requirement. Whether you buy or refinance with USDA, you’ll get one of the lowest rates available for any mortgage, and a fantastic loan program, too. You might get 4.0% today, and 4.125% tomorrow. A myriad of factors alters the direction of current mortgage rates. To get a synopsis of what’s happening today, visit our daily rate update. Here you will find live rates and what’s affecting today’s mortgage rates. No matter which type of mortgage rates you’re shopping for, following mortgage rates is never boring. So many factors affect them — from oil prices to inflation to geopolitical conflict — it’s nearly impossible to predict exactly what will happen. But we can try. By focusing on major events with market-moving potential. September holds a Federal Reserve meeting plus continued developments in U.S. and world events that will likely shift rates for better or worse. The Fed can’t agree on when to hike rates next. The committee’s July meeting, on the surface, was a snoozer. No one expected a rate hike or changes in economic policy. But on August 16, the Fed released its meeting minutes, and there were surprises. That document revealed contention between members on when exactly to raise the federal funds rate, the group’s benchmark rate that drives many types of interest rates within the U.S. economy. Some members argued that inflation could be slowing down. Another rate hike, they said, would hurt the Fed’s goal of getting inflation back up to 2 percent annually. Other members said it’s too risky to leave rates so low. Unemployment is near all-time bests and the economy is heating up. Inflation could pop well above the 2-percent mark, leaving the Fed with the much harder job of slowing inflation down. That puts tremendous focus on the September meeting. At four meetings per year, the Fed releases its own projections on future rate hikes. September is one of those meetings. All eyes will rest upon the Fed’s projection materials to see whether they expect to hike rates in December or not. Backing up a step, analysts give just a 3% chance of a hike (as of this writing) at the meeting which adjourns on September 20. But, most do expect rates to rise at the group’s final meeting of the year on December 12-13, 2017. Economists and consumers will be looking at Fed projections to gauge the group’s solidarity to raise rates in the near future. 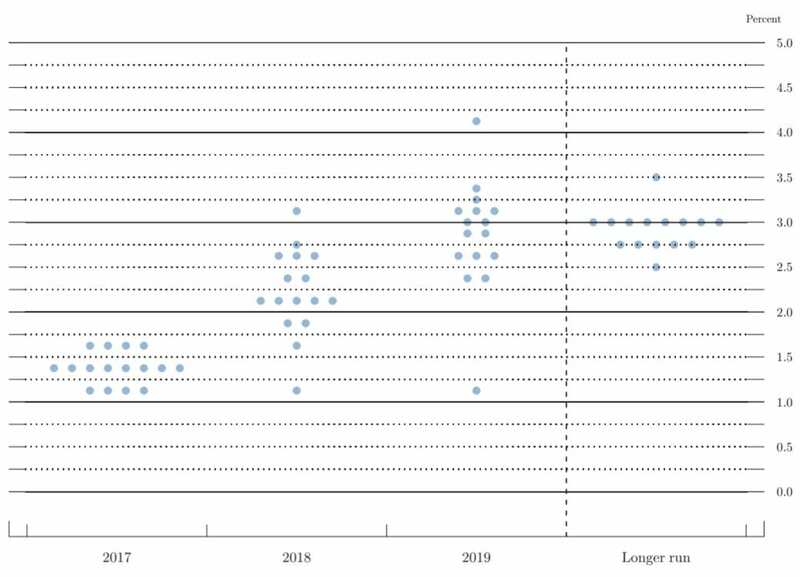 One of the more interesting pieces within projections is the Fed’s “dot plots.” Each dot represents one member’s prediction about the path of the federal funds rate over the next few years. Currently, the rate stands between 1 and 1.25 percent. So in June, the consensus fell on rates rising an additional quarter point by year’s end. Outliers had rates remaining unchanged, and some forecasted two rate hikes left this year. In September, analysts will be comparing June’s dot plot to the updated version. If more dots land above the current consensus, consumer mortgage rates could rise in anticipation of a more aggressive Fed. But if there’s less threat of a December rate hike, consumer mortgage rates could fall in response. Remember that the Fed doesn’t control consumer mortgage rates. But it can push up other types of rates in the economy. That tends to move rates across the entire lending landscape. Another massive policy shift on the horizon is what the Fed will do with its monstrous holdings of mortgage-backed securities and U.S. Treasuries. It accumulated massive amounts of securities during the recession late last decade. It sought to bring down borrowing costs and spur economic growth after the worst downturn since the Great Depression. It worked. Homeowners refinanced like few times in history as fixed-rate mortgages hit the low 3s. That freed up cash in the collective American wallet which was then pumped back into the economy in the form of spending, saving, and investing. But it wasn’t a perfect solution. Now, the Fed holds about 13 percent of all U.S.-issued debt and 12 percent of all mortgage debt in the country. And it has to find out how to offload the mountain of securities. It has to do so carefully. Selling large swaths of mortgage debt or Treasuries would flood the market. As supply goes up, demand goes down. Interest rates would need to rise to spur investors to keep buying these assets. Mortgage rates are directly tied to the interest rates on these securities. So the Fed does not plan to sell these securities at all. Rather, it will simply not reinvest principal when these debts are paid back. But even that will increase supply in the market. That’s why money managers will be looking for a clear plan as the Fed meets again in September. The group could release further details about when the debt roll-off strategy will commence. If the Federal Reserve kicks off the plan in September, we could see rates rise, since most analysts expect a December start date. Rates could fall if the Fed plans to keep reinvesting these debts back into holdings until 2018. Rates have been falling all year. Unfortunately, the phenomenon is due to political mishaps and ever-increasing threats from an unstable Asian power. Remember that rates rose at the start of 2017 thanks to high hopes of a gangbusters economy. Donald Trump had just been elected, and he promised tax reform and infrastructure programs that would spur the economy like few times in history. Since then, the administration has been embroiled in all sorts of controversies. These are slowing down economic reforms, the hope for which caused rates to rise in the first place. In turn, mortgage rates are dropping steadily this year as the balloon slowly deflates. The U.S. economy hasn’t taken off as expected, so mortgage rates are doing quite well. Recent actions in North Korea are also weighing on optimism, which tends to help rates. Numerous missile tests and increasingly aggressive statements from the regime point to the possibility of war. Geopolitical unrest sends investors fleeing to safer assets such as mortgage-backed securities. U.S. mortgage rates rise and fall based on demand for these assets. When demand goes up — as happens during threats of war — mortgage rates fall. Again, it’s an unfortunate circumstance that happens to benefit mortgage consumers. Because these issues are, by nature, tough to resolve, we could see continued improvement in rates for September. The next thirty days hold no shortage of market-moving news that will change the current mortgage rates trend. Notably, watch for the Fed meeting adjournment on September 20. Rates could swing wildly on an unexpected outcome. Mortgage rates are holding below 4 percent, to the surprise of analysts. Home buyers have excellent purchasing power, and refinancing households can save more cash than they could just months ago.